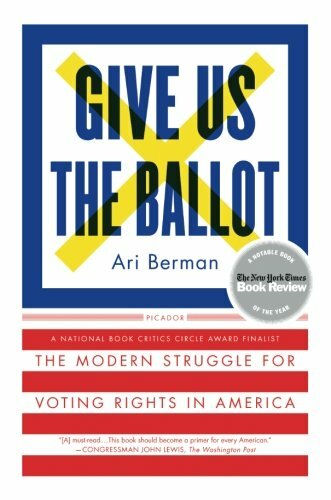 Since its 2015 publication, Ari Berman’s Give Us the Ballot has received near universal acclaim, including Notable or Best Book of the Year status from The New York Times, The Washington Post, Kirkus Reviews, and NPR. Those accolades are well-deserved: Berman begins with the 1965 passage of the Voting Rights Act to narrate with nuance and power the largely forgotten history of the law’s subsequent five decades of challenges and victories. With the recent publication of the paperback edition as impetus, and the 2016 presidential election as context, revisiting Berman’s book offers new lessons, takeaways from this hugely effective book that can inform both our public scholarly work and our collective national memories. For public scholars, Berman’s book highlights the power of voices and stories to convey histories and ideas. Berman’s a journalist, and his book reflects a central tenet of good reporting: he consistently uses the voices and stories of individual figures to narrate sweeping historical moments, debates, and political and social philosophies. Moreover, those voices and stories guide readers to the overarching points, rather than the other way around. While some of those figures represent obvious and unavoidable choices—Civil Rights activist John Lewis, Lyndon Johnson’s Attorney General Nicholas Katzenbach—many others are far less well known and are brought to life with depth and sympathy. Texas farmer and Chicano rights advocate Modesto Rodriguez is a particularly compelling example. And other focal figures would become prominent long after the moments Berman traces so effectively, such as a 1980s law clerk named John Roberts who became first a leading opponent of the Voting Rights Act and then, decades later, George W. Bush’s nominee for Chief Justice of the Supreme Court. Too often, public scholarly works focus primarily on the big picture and on academic conversations about sweeping historical and theoretical debates. Berman’s book takes its place among those conversations to be sure, but does so through assembling these narratives and details about individuals and moments, voices and stories that convincingly and potently bring readers into the histories and all their stakes. Those stakes could not be more present in 2016, and on that level as well Berman’s book offers a valuable lesson: The work and relevance of the Civil Rights Movement continues. American collective memories of the movement tend to locate it firmly in the 1960s and to define it both as a necessary response to that period’s racist laws and structures and as a successful social movement that helped end those problems. Seen through that lens, the Voting Rights Act becomes a case in point: Southern voting practices were racist, and the VRA helped African Americans gain that fundamental American right. Berman’s opening chapters do indeed highlight the widespread problems with voting and race in 1960s America and the VRA’s hard-fought victory against those challenges. But with every subsequent chapter he delves just as deeply into the continued and far less well-known challenges to and attacks on the VRA in the years since its passage, with every decade presenting new opposition from white Southern officials, conservative politicians and scholars, and other opponents. These subsequent challenges might not have been the same as they were in 1965, but no attentive reader of Berman’s book can conclude that they were not just as substantive and serious, nor that a continued movement to protect and extend voting rights—an ongoing civil rights movement, that is—was not necessary. When Berman brings the story up to the Roberts Supreme Court’s 2013 decision, in Shelby County v. Holder, to invalidate key sections of the VRA, he thus makes clear that this moment represents one more challenge to the VRA, one more occasion for a movement to defend that act and the right it protects. That story continues to unfold, as three recent Appeals Court decisions have overturned voting restrictions passed by state legislatures. The Fourth Circuit Appeals Court, responding to North Carolina’s Voter ID law, argued in its decision that the law had been constructed to target African Americans “with almost surgical precision.” Without the voices and stories on which Berman’s book focuses, we might not understand the longstanding historical contexts for such moments, nor appreciate the need for continued vigilance on behalf of voting rights. Benjamin Railton's most recent book is The Chinese Exclusion Act: What It Can Teach Us About America. He is also Professor of English and American Studies at Fitchburg State University in Massachusetts.